As we enter the season of new growth in nature, we’re also celebrating the growth of our foundation. We’re halfway through April, and busy is the word of the month here at the Cristian Rivera Foundation! As the warm weather approaches, so does our first ever Cristian Rivera Foundation 5K Walk and Run. 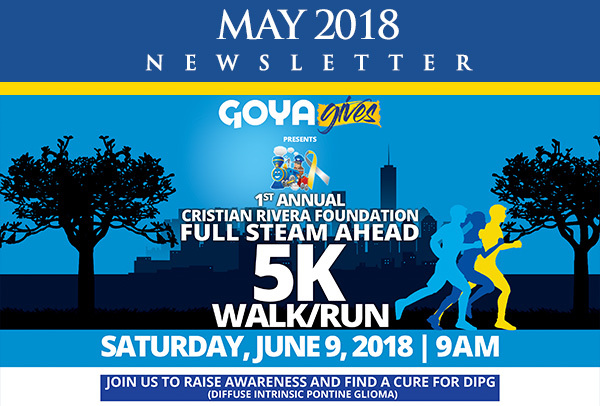 The 1st Annual Cristian Rivera Foundation 5K Walk and Run will be held on Saturday, June 9, 2018, at Van Cortlandt Park in the Bronx, 15 minutes from Manhattan and the George Washington Bridge. The registration process will begin at 8:30 AM and the Run/Walk will commence at 9:00 AM. This event will raise money to increase public awareness of DIPG, as well as raise funds that will provide financial support to families and medical facilities that conduct innovative research and clinical trials. 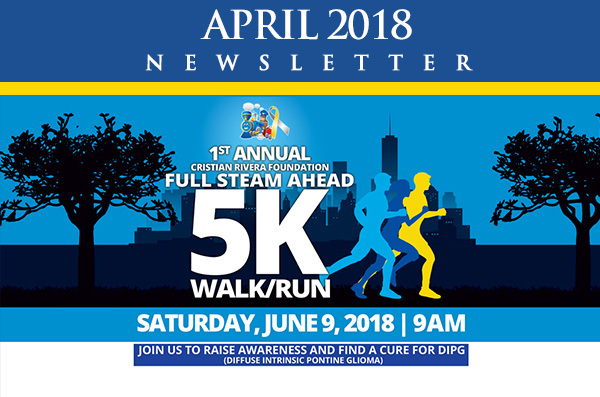 Take a stand against DIPG with us by sponsoring, participating, volunteering and donating in the 1st Annual CRF “Full Steam Ahead” 5K. You can help us continue our progress and give hope to more children and families affected by DIPG. Take a stand against DIPG with us by getting involved the 1st Annual CRF “Full Steam Ahead” 5K. Run or Walk in 5K. The entry fee is $25.00 and will include a 1st Annual Cristian Rivera Foundation Full Steam Ahead 5K Run/Walk t-shirt. We encourage all CRF 5K participants, to fundraise a minimum of $250.00. If you fail to meet the quota, you will still be able to participate in the 5K and take a stand against DIPG. To sign up to participate in the 5K please visit cristianriverafoundation.org/crf5kwalkrun/register/. Become a Virtual Participant in the 5K. Want to participate but live outside the Tristate area or going to be out of town? Become a Virtual Participant! The entry fee is $25.00 and will include a 1st Annual Cristian Rivera Foundation Full Steam Ahead 5K Run/Walk t-shirt. Our foundation asks for all Virtual Participants to take a picture with their t-shirt and e-mail it to crf5K@cristianriverafoundation.org for display on our website. We also encourage all CRF 5K participants, to fundraise a minimum of $250.00. If you fail to meet the quota, you will still be able to participate as a Virtual Runner/Walker in the 5K and take a stand against DIPG. To sign up as a Virtual Participant in the 5K please visit cristianriverafoundation.org/crf5kwalkrun/register/. Create a Team. Each team member is required to pay the $25 entry fee and will receive a 1st Annual Cristian Rivera Foundation Full Steam Ahead 5K Run/Walk t-shirt. We encourage each team member to fundraise a minimum of $250.00. If any team member fails to meet the quota, they will still be able to participate in the 5K and take a stand against DIPG. To create a team and take part in the 5K please visit cristianriverafoundation.org/crf5kwalkrun/team-registration/. Join a team. You’ll be able to raise funds for DIPG along with your family, friends and colleagues. Each team member is required to pay the $25 entry fee and will receive a 1st Annual Cristian Rivera Foundation Full Steam Ahead 5K Run/Walk t-shirt. We encourage each team member to fundraise a minimum of $250.00. If any team member fails to meet the quota, they will still be able to participate in the 5K and take a stand against DIPG. To join a team and take part in the 5K please visit cristianriverafoundation.org/crf5kwalkrun/team-registration/. Sponsor the event. To sponsor the 5K please visit cristianriverafoundation.org/crf5kwalkrun/sponsorship/. Become a Volunteer. To become a volunteer for the 5K please visit cristianriverafoundation.org/crf5kwalkrun/volunteer/. Donate. Help support raising funds for DIPG by donating. To make donations please visit cristianriverafoundation.org/crf5kwalkrun/donate/. Just remember that signing up to get involved is just the first step – fundraising is what makes the difference! Our foundation would like to acknowledge some longtime supporters and the Sponsors for the 1st Annual CRF “Full Steam Ahead” 5K. A big thank you to Rivera Marketing and Media Group for becoming a Platinum Sponsor for the 1st Annual CRF “Full Steam Ahead” 5K. The Little Kernel, Joule Entertainment and Weill Cornell Medical Center for becoming Gold Sponsors. Medicare & Medicaid Advisory Group and Calle Ocho for becoming Silver Sponsors. Lastly, CarePoint Health for becoming Bronze Sponsors. All of these sponsors have continuously supported our foundation and we truly appreciate their efforts. If you are interested in Sponsorship/Advertising opportunities go to cristianriverafoundation.org/crf5kwalkrun/sponsorship for details. Deadline for Sponsorship must be in before Friday, May 25th, 2018 at 5 p.m. Sponsoring, participating, and volunteering in the 1st Annual CRF “Full Steam Ahead” 5K isn’t the only way you can get involved. You can also purchase silent auction items that are available for bidding on cristianriverafoundation.org/auction. 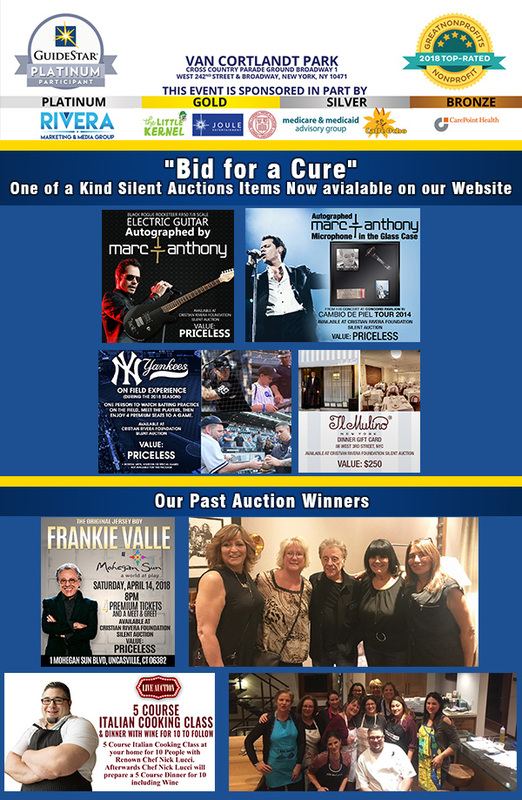 We have a great variety of things such as an NY Yankees on field experience and an autographed Marc Anthony microphone. Also, our past items have included Four (4) Premium Tickets to see Frankie Valle at the Mohegan Sun Arena, plus a meet and greet and a 5 Course Italian Cooking Class at your home for 10 People, with Renown Chef Nick Lucci. These auction items are incredible and one can purchase them in efforts to eradicate DIPG. As one can see, whether you are sponsoring, participating, volunteering, donating or purchasing auction items, you are helping in making a difference. Help us make 2018 the year we say goodbye to DIPG. We thank you for your continued support and look forward to helping those affected by DIPG with your help. With the days getting longer and springtime just around the corner, The Cristian Rivera Foundation is leaping into March with a renewed sense of excitement! As we forge ahead into a season that celebrates life and regrowth, we ask you to join us in working to save the lives of DIPG children around the world. Our foundation has a variety of events coming up, including our first ever Cristian Rivera Foundation 5K Walk and Run. 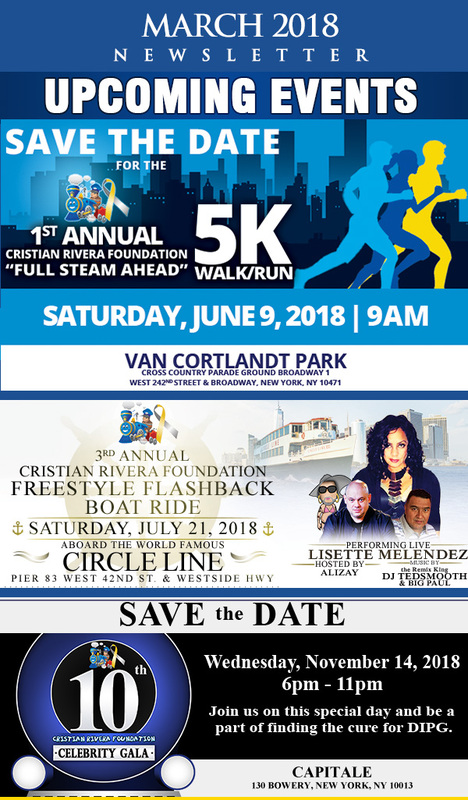 The 1st Annual Cristian Rivera Foundation 5K Walk and Run will be held on Saturday, June 9, 2018, at Van Cortlandt Park in the Bronx, 15 minutes from Manhattan and the George Washington Bridge. The registration process will begin at 08:30 AM and the Run/Walk will commence at 9:00 AM. This event will raise money to increase public awareness of DIPG, as well as raise funds that will provide financial support to families and medical facilities that conduct innovative research and clinical trials. Take a stand with us by taking a walk or run and help give our children an opportunity to fulfill their dreams. Let’s cure DIPG together. Another event you should also be excited about is our 3rd Annual Cristian Rivera Foundation Freestyle Flashback Boat ride on Sat. July 21st. Join us as the New York skyline serves as a backdrop and music is provided by New York’s top DJ’s. We also have a live performances by Freestyle Diva Lisette Melendez scheduled and surprise celebrity guests. Party for a cause with us. We are also preparing for the release of The Children’s Book, “Cristian’s Journey”, a story inspired by Cristian Rivera. 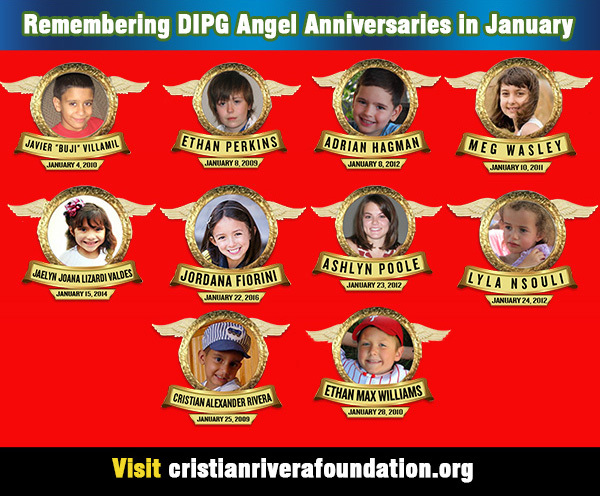 The book will honor Cristian’s legacy and will educate the public about DIPG and our commitment to curing the disease. As always, 100% of the proceeds of the book will be donated to Weill-Cornell Medical Center and their clinical trials. We are also pleased to announce that the 10th Annual Cristian Foundation Celebrity Gala which will take place on Wednesday, November 14th. 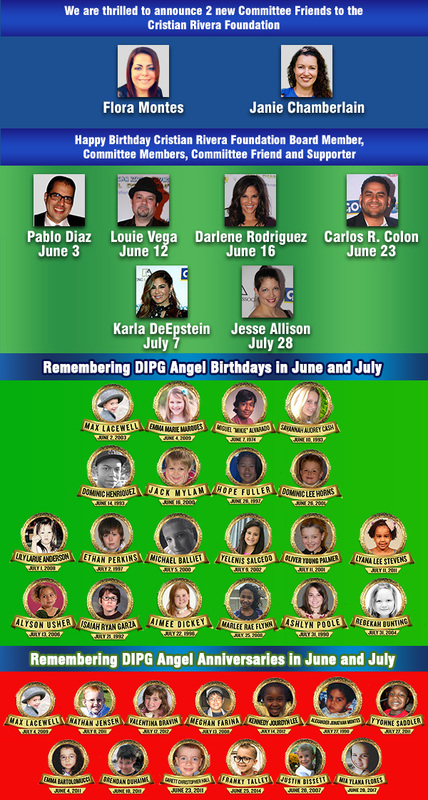 Join us as we come together to celebrate a decade of work in the DIPG community and honor some very special people. This event promises to be our biggest gala yet. 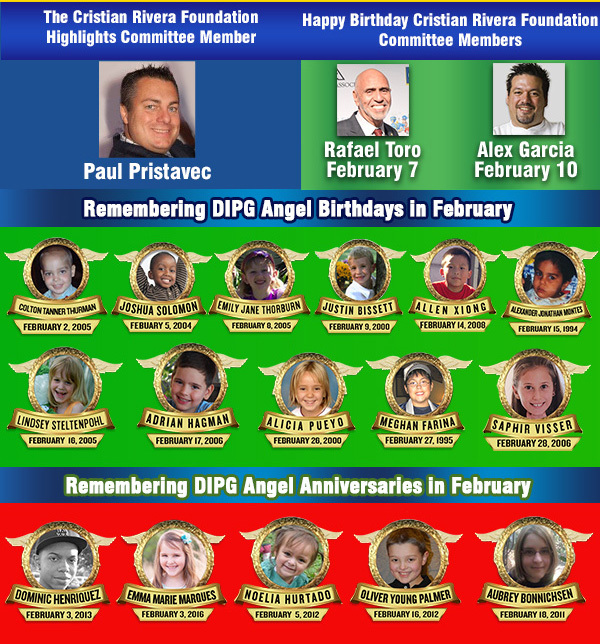 Since the year started, our foundation has been working tirelessly to continue giving DIPG the voice it deserves. 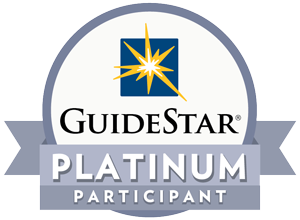 As a result of our hard work, The Cristian Rivera Foundation was awarded a Platinum Seal on GuideStar.org. GuideStar.org is the non-profit industry leader in analysis and public information and issues their rating based on transparency and the positive activity conducted in the non-profit community. Not only does our foundation have a Platinum Seal on GuideStar.org, The Cristian Rivera is also the recipient of the 2018 Top-Rated Great Nonprofits Award from Great Nonprofits. As you can see, our foundation takes pride in the work we do and we’re honored to have received such prestigious awards for our hard work, commitment and dedication. Speaking of great supporters and being part of our journey, CRF’s highlighted Member of the Month is Cristian Rivera Foundation Committee Friend Modesto Lacen. I’m an actor and producer with 25 years of experience in Theater, TV, Film and Radio in Puerto Rico, United States and Colombia. Besides my artistic career I believe in contributing to society through the work I can do as a responsible citizen, I firmly believe that a better world is possible. Is it for that reason that I’m a proud member of the Board of Directors of Taller Salud in my hometown Loiza, PR and the Cristian Rivera Foundation. What does it mean to you to be a part of the Cristian Rivera Foundation? As the son of a successful owner of various Clinical Laboratories in Puerto Rico, I know the importance of living a healthy and productive life. Been a part of the Cristian Rivera Foundation is rewarding for me because in the effort we do as a Foundation, we are making a real difference in children’s life. 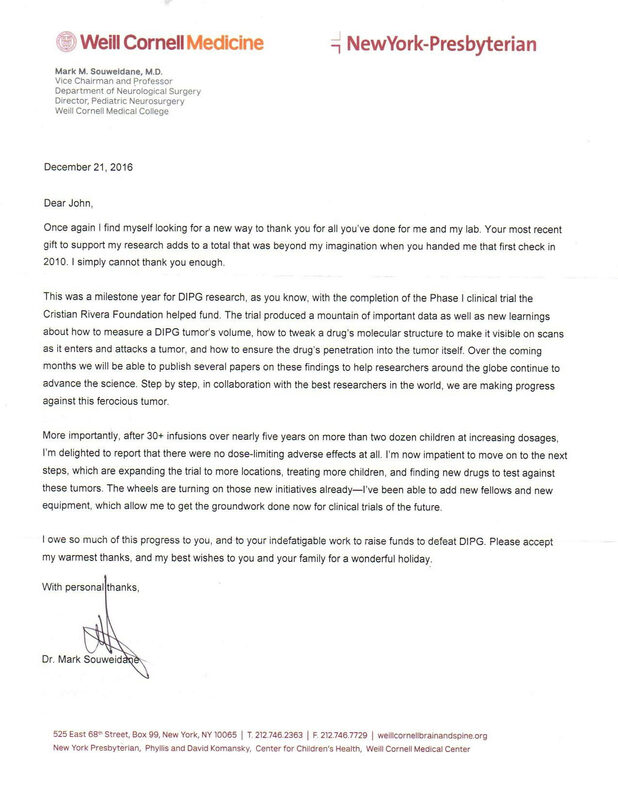 The support we give to doctors and the families with children with DIPG is invaluable. 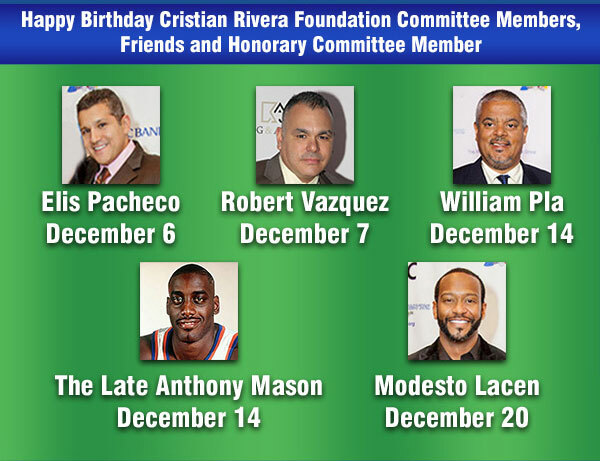 What is your proudest moment as a Cristian Rivera Foundation Committee Friend? My proudest moment as a Committee Member was when I had the honor of participating in one of our Galas with the son of one of my heroes, Roberto Clemente Walker. Sharing that special moment with Roberto Clemente, Jr was a pivotal moment that reaffirms my mission as part of the Cristian Rivera Foundation. To be of service for the well being of our society. Modesto Lacen, Pablo Diaz, Robert Dominguez, Teddy “Tedsmooth” Mendez and William Pla. February is a special month; A time to display your feelings for your friends and family for their love and support throughout the year. This February has been an amazing month for the Cristian Rivera Foundation, and that’s all because of your love and support of our foundation. This past week, Lisha Ayala, A DIPG patient who is participating in the clinical trials that the Cristian Rivera Foundation is funding, received her quarterly MRI results. The tests were stable with no activity or tumor growth! This is her 5th year living with DIPG, providing the medical community an opportunity to learn more and make monumental strides in research. Lisha continues to live the life of a normal teenager and has given us hope that we are close to a cure. This is all possible through your love and support of our mission. GuideStar.org is the non-profit industry leader in analysis and public information. Guidestar.org issues their rating on transparency and the positive activity conducted in the non-profit community. 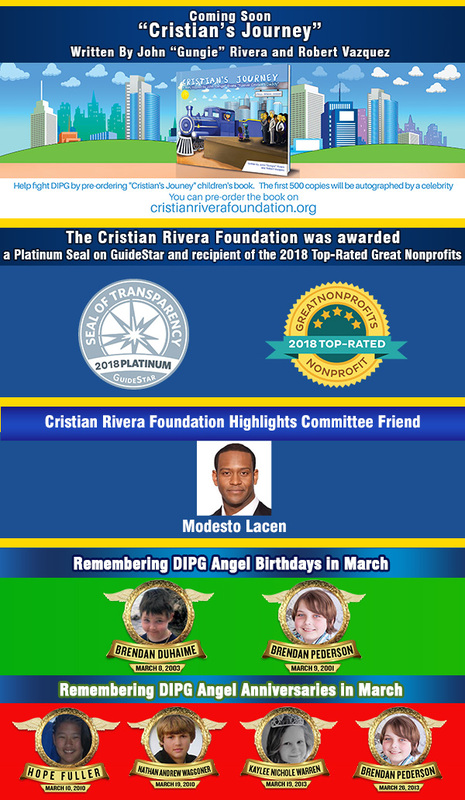 The Cristian Rivera Foundation is honored to be awarded a Platinum Status for our efforts, commitment and transparency. One can only be excited for what’s to come the next couple of months. Our foundation has so many events planned for 2018. 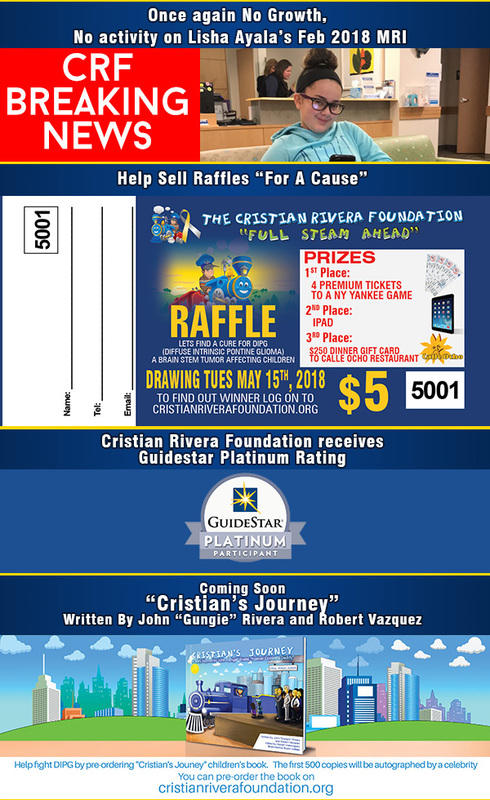 We have our Raffle Project, the 1st Annual Cristian Rivera Foundation “Full Steam Ahead 5K” Sat June 9th, the 3rd Annual Cristian Rivera Foundation Freestyle Flashback Boat ride Sat July 21st, The Children’s Book “Cristian’s Journey” will be out in the Spring and the 10th Annual Cristian Foundation Celebrity Gala will take place on Wednesday, November 14th. 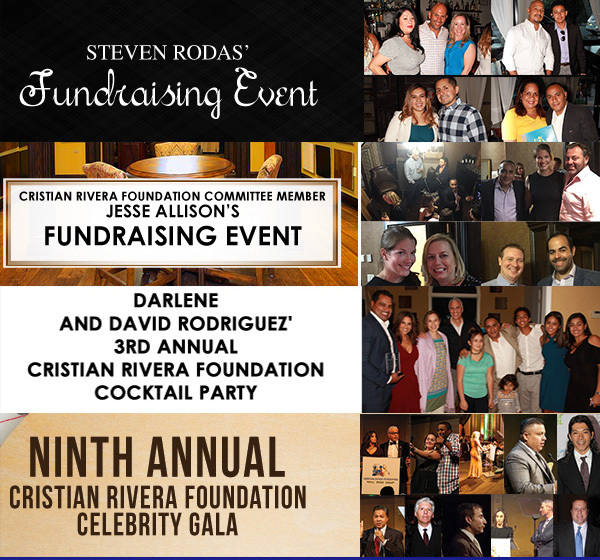 Please visit our website at cristianriverafoundation.org and stay connected with all of our events, view our gallery and sign our guestbook to let us know you stopped by! We would like to thank everyone who has supported our foundation by attending, sponsoring, and donating. Lastly, all of us at the Cristian Rivera Foundation wish you a very happy Valentine’s Day! Show love to our foundation with your kind donation today! Speaking of great supporters and being part of our journey, CRF’s highlighted Member of the Month is Cristian Rivera Foundation Committee Member Paul Pristavec. Paul has been an incredible member. Paul Pristavec, a Staten Island native father of 6, is a Wealth Management Advisor at Merrill Lynch. He joined Merrill Lynch in 1992 and has been advising high net worth individuals and wealthy families since 1996. He is a parishioner of Our Lady Star of the Sea Roman Catholic Church and is involved in charitable work for the Archdiocese of New York. Paul Coaches CYO basketball at Our Lady Star of the Sea. Paul loves to take his children to all their sporting events. Paul and his wife Dana reside in the Tottenville section of Staten Island. Being a part of the Cristian Rivera Foundation is rewarding in so many ways. 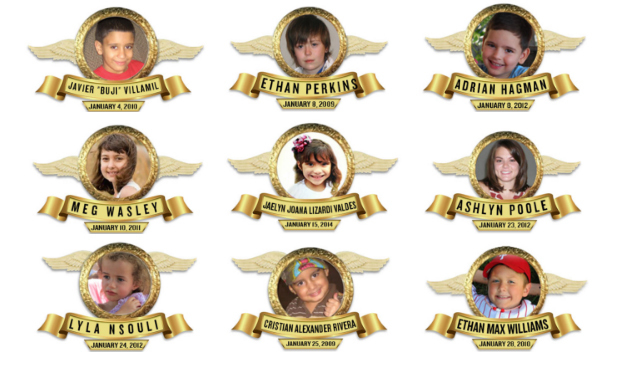 Being a father of 6, I can’t imagine what it must feel like to lose a child. It means so much to me to be a part of an organization that is giving back and making a difference in the lives of so many children and families. 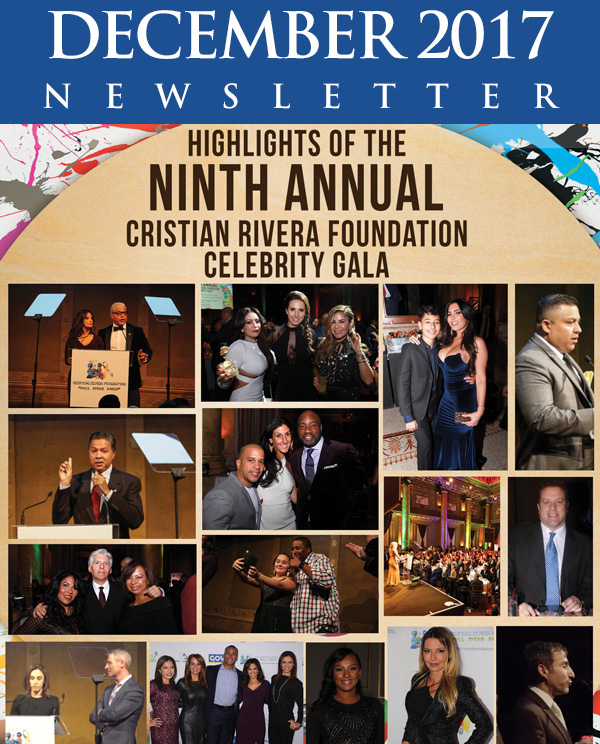 What is your proudest moment as a Cristian Rivera Foundation Committee Member? My proudest moment as a Cristian Rivera Foundation Committee Member was on Wednesday, February 7, 2018, when I learned about Lisha’s progress. Lisha’s MRI results came up favorable and I’m honored to have been a part of that. This is a reminder of why I am involved in the Cristian Rivera Foundation and put in the time that I do. Lisha is proof that we are headed in the right direction and that one day, we will not fear DIPG. All donations are appreciated and go a long way. Please be sure to follow us on Twitter @TweetCRF, Instagram @cristianriverafoundationand like us on Facebook at www.facebook.com/crisitanriverafoundation to stay up to date on the latest news and all of our exciting new upcoming events for 2018! 2017 was a milestone year for the Cristian Rivera Foundation. 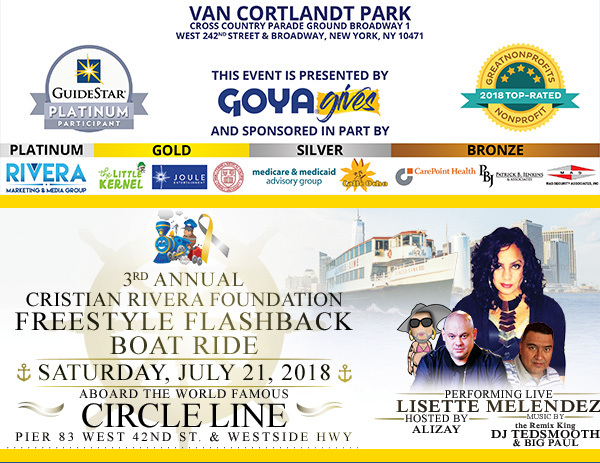 Our 2017 events included the 2nd Annual Cristian Rivera Foundation Freestyle Flashback Benefit Boat ride. Committee Members, Steve Rodas and Jesse Allison hosted their own cocktail events to support our efforts in curing DIPG. NBC’s Today in New York co-anchor and Cristian Rivera Board member, Darlene Rodriguez and her husband, David, hosted their 3rd Annual Cocktail Party. 2017 also brought us the Ninth Annual Cristian Rivera Foundation Celebrity Gala at the luxurious Capitale in New York City. These events and the continued support from our sponsors and people like you, have brought us to a monumental milestone in the DIPG and medical community. As of 2017, the Cristian Rivera has donated over One Million Dollars ($1,000,000) to help support research and clinical trials for DIPG and families who have been affected by this disease!Your generosity and support has brought us closer than ever to a cure for DIPG! We would like to thank everyone who has supported our foundation by attending, sponsoring, and donating to these events. Also, a big thank you to all our Board of Directors, Committee Members, Committee Friends for their continuous support. 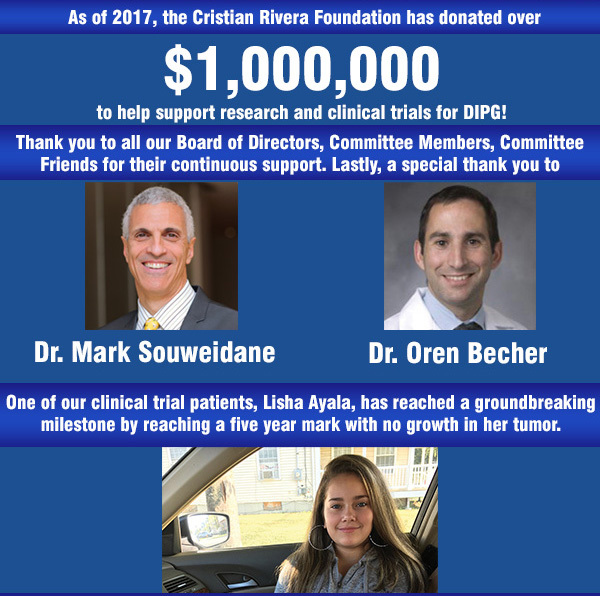 Lastly, a special thank you to Dr. Mark Souweidane and Dr. Oren Becher for working tirelessly towards finding a cure for DIPG. Without any of you, none of these accomplishments would have been possible. One of our clinical trial patients, Lisha Ayala, has reached a groundbreaking milestone by reaching a five-year mark with no growth in her tumor. She is living the life of a normal teenager and has given the DIPG and medical community hope that we are close to a cure. Even though we’ve started 2018 on a great note, January is always a sad month for The Cristian Rivera Foundation. First, Cristian was Diagnosed with DIPG on January 21st, 2007 and lost his Battle to DIPG just two short years later on, January 25th, 2009. Cristian would have been 15 years old had he’d been alive today. In honor of Cristian, our foundation will continue working the “Full Steam Ahead” mentality until we eradicate this disease from our world and no family has to suffer through the process of dealing with a child with DIPG. You can be a part of the journey of finding a cure for DIPG, and make 2018 the year we say goodbye to this horrible disease. Simply stay connected with us. Join us at our events, share our journey with your friends and family and make a donation to our efforts. Speaking of great supporters and being part of our journey, The Cristian Rivera Foundation highlighted Member of the Month is Committee Member, Jesse Allison. 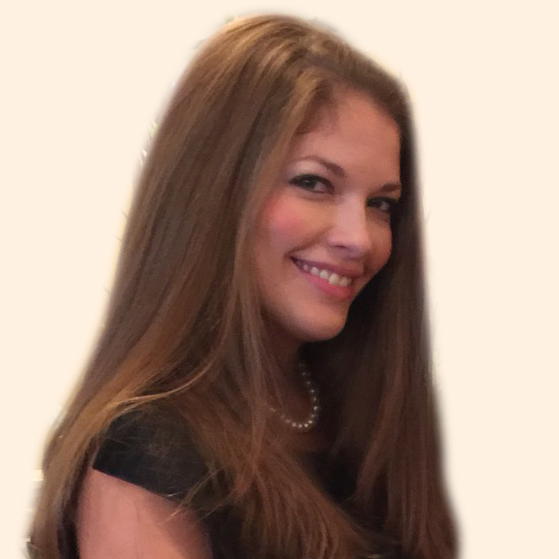 Using her experience and resources, Jesse has been an incredible addition to our team and made valuable contributions to our goals through her hard work and dedication. I am a 34-year-old working mother and wife. I have a three-year-old daughter named Addison and a wonderful supportive husband, Thomas. I grew up in the suburbs of Chicago. After spending many years planning events in the hospitality industry, I left to develop a family business of high end flooring. By making this move, my schedule became more flexible. Having a flexible schedule is important to me because I get to spend more time with my family. Probably my greatest passion after spending time with my family is cooking. Being a part of the foundation is more rewarding than I could’ve hoped. I’ve known John since I moved to Hoboken and as the mother of a small child, I cannot begin to fathom what hearing that my daughter had DIPG would be like. I think what Dr. Mark Souweidane and Dr. Oren Becher do is amazing work and I know that the more support we can generate for the doctors, the closer we are to that cure. My proudest moment was at the small cocktail reception we hosted at our showroom Wood Library in Hoboken. I was happy seeing the responses to the information we were presenting. Throughout the reception, the attendees really started to understand a little about this horrible disease which led them to wanting to help. By throwing this event, I was able to raise awareness of DIPG and help the many families affected by this disease. All donations are appreciated and go a long way. Please be sure to follow us on Twitter @TweetCRF, Instagram @cristianriverafoundationand like us on Facebook at www.facebook.com/crisitanriverafoundationto stay up to date on the latest news and all of our exciting new upcoming events for 2018! Tony Ferrara and Vito Bruno. The Late Anthony Mason and The Late Miriam Colon. 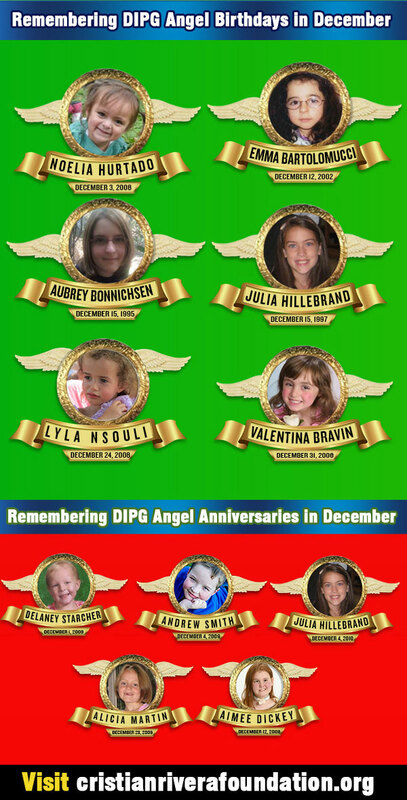 The holidays are an important time to spend with the ones you love, and also a sad time for DIPG families all around the world. 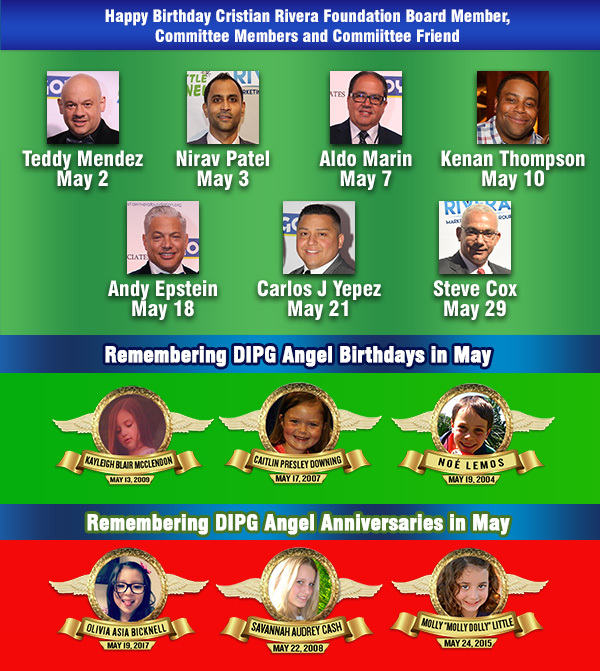 Families that are affected by DIPG are either marking these special occasions without their child or preparing for what they know will be the last holiday to spend with them. Thanks to the countless amount of support we have received, one day families will not have to fear DIPG. Your generosity means a lot to not only us, but also to the many DIPG families who have had to suffer because of this horrific disease. Even though our foundation has great supporters, we could always use more. For this reason, we ask you to hop on board and consider helping our foundation. You can be a part of the journey of finding a cure for DIPG, and we can make 2018 the year we say goodbye to this disease. Speaking of great supporters and being part of our journey, CRF’s highlighted Member of the Month is Cristian Rivera Foundation Committee Member Jarrad Seuferling. Jarrad has been an incredible addition to our team. I am the Vice President of MAS Security Associates. I have worked in the security and nightlife industry for over 20 years. I have brokered dozens of deals in the entertainment industry and am passionate about helping others. Uniting people to elevate businesses is one of my top priorities. I am a proud husband and father of two and have been a Committee Member for one year. I love the team work and unity of our foundation. We are like a family. It feels so good when I see the progress that we’re making. When I hear about the progress the two doctors have made, I get happy because I know that one day a cure for DIPG will come. I am inspired by John ‘Gungie’ Rivera and Andy Epstein who are really great leaders. As a Cristian Rivera Foundation Committee Member, my proudest moment was a few days ago when I learned that once we give Dr. Oren Becher his check, we will have reached the One Million Dollar Donated mark. As Jarrad said, we are so proud of reaching the One Million Dollar Mark and none of this could be possible without your help. All donations are appreciated and go a long way. Please be sure to follow us on Twitter @TweetCRF, Instagram @cristianriverafoundation and like us on Facebook at www.facebook.com/crisitanriverafoundation to stay up to date on the latest news and all of our exciting new upcoming events for the New Year! Have a happy holiday season and a wonderful New Year. The Cristian Rivera Foundation is a 501 (c)(3) Non-Profit Organization that works tirelessly, in order to raise awareness and funds to one day put a STOP to this disease. 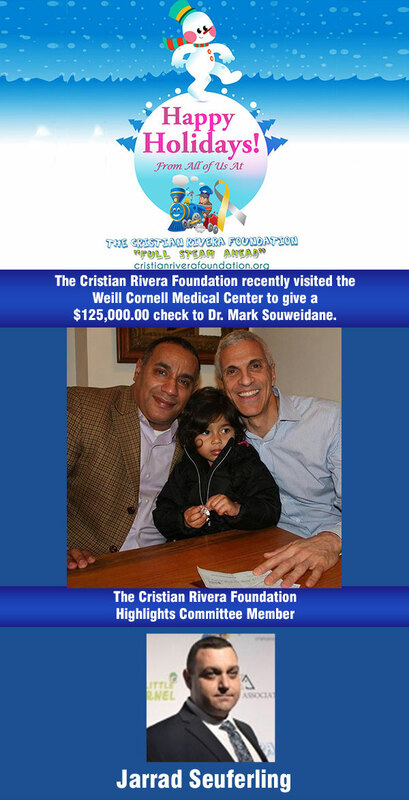 The Cristian Rivera Foundation funds the work of Dr. Mark Souweidane of Weill Cornell Medical Center – Memorial Sloane (Kettering) Cancer Center and Dr. Oren Becher of Ann & Robert H. Lurie Children’s Hospital and the Lurie Cancer center at Northwestern University. Both Doctors are conducting promising research and trails that have shown promising results. We are CLOSE to a CURE! Copyright © 2017 Cristian Rivera Foundation, All rights reserved. 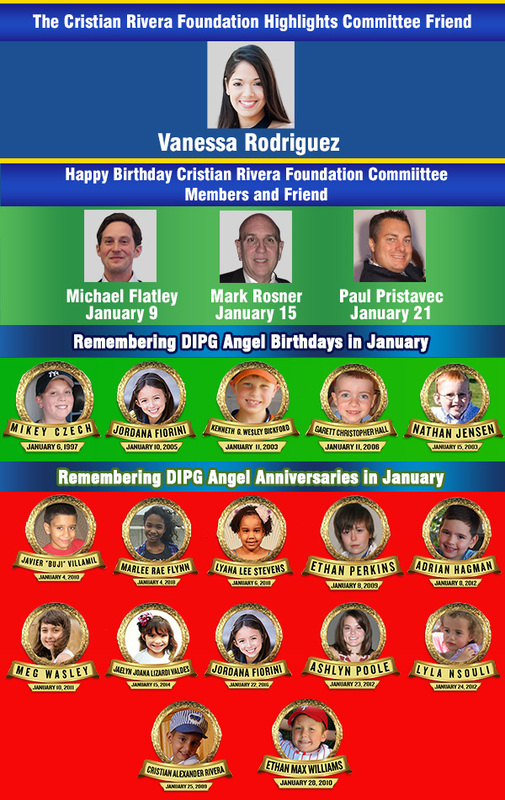 January is always an sad month for The Cristian Rivera Foundation. 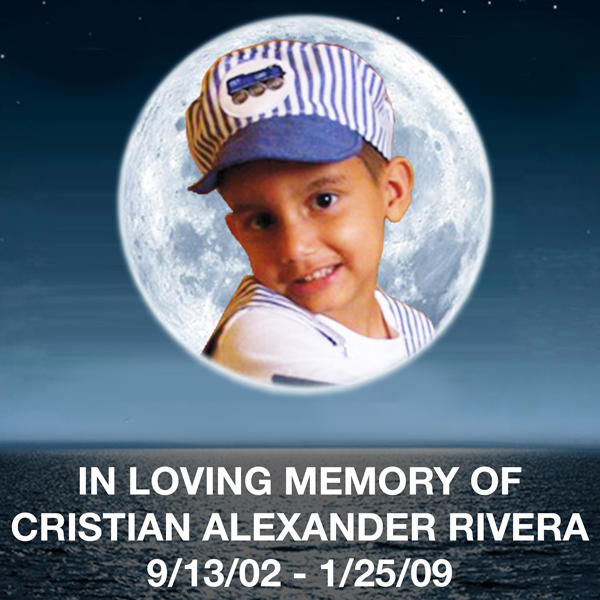 First, Cristian was Diagnosed with DIPG January 21st, 2007 and Lost his Battle to DIPG January 25th 2009. Cristian would have been 14 years old had he’d been alive. But this January we have something to be Happy about, it marks 4 years Lisha has had DIPG and is doing GREAT. Just a few weeks ago we learned that her latest MRI showed NO GROWTH. Lisha is living proof that we will find a cure for DIPG. 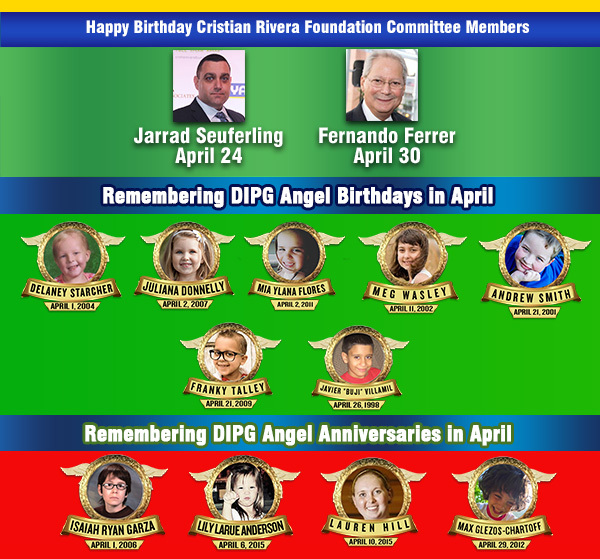 The Cristian Rivera Foundation exists to fight until the day that being Diagnosed with DIPG is just a bump in the road and not a death sentence. The Cristian Rivera Foundation is also very excited to announce that we have donated $140,000 Weill Cornell and Duke from the proceeds 8th Annual Celebrity Fundraising Gala which was on November 30th. We were thrilled with the Gala this year and are grateful to all our Board of Directors, Committee Members, Committee Friends, Sponsors, Advertisers and Supporters. We worked so hard to make this the best event to date. 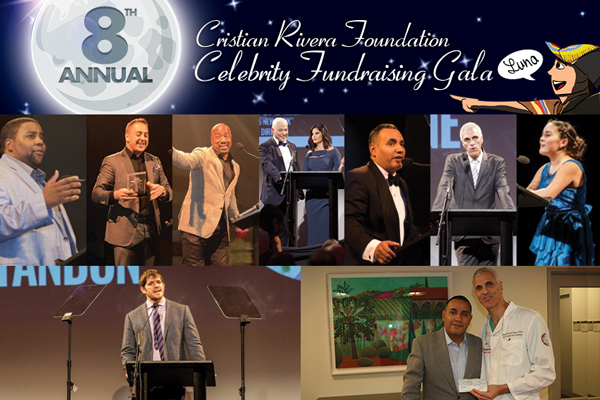 If you couldn’t participate at the 8th Annual Celebrity Fundraising Gala, you can still help by making a donation. All monetary contributions are tax-deductible. All support is appreciated and brings us one step closer to a CURE. 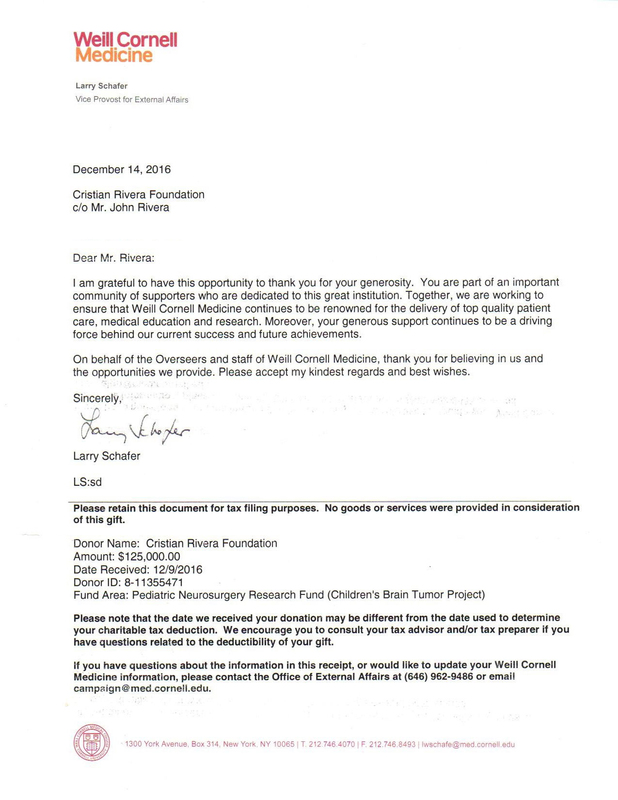 Here are 2 letters the Cristian Rivera Foundation received after this year’s Gala. 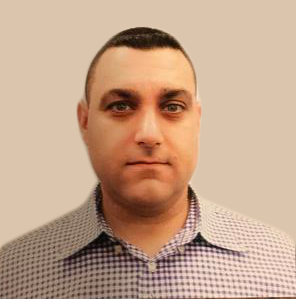 Vice President of MAS Security Associates, Jarrad Seuferling, has worked in the security and nightlife industry for over 20 years. He has brokered dozens of deals in the entertainment industry and is passionate about helping others. Uniting people to elevate businesses is one of his top priorities. Jarrad Seuferling is a proud husband and father of two. Jesse was born and raised in Chicago Illinois and moved to the east coast 5 years ago to take over sales and marketing for Zylo Restaurant in the W hotel. She’s currently the Director of Business Development for Helena Floors, a project she co–developed with her partner Thomas.